Update: Thanks to everyone who download the Spotter Guide this year. Its been a huge success and a continued increase on previous years figures. Thanks again. The 2 page Spotter Guide for Petit Le Mans, the final round of The American Le Mans Series and the penultimate round for the Le Mans Intercontinental Cup is now available to download. 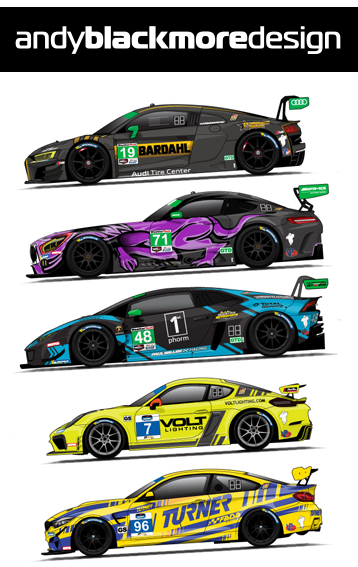 The guide was last updated Thursday 29th September at 230am EST with a number of livery updates and latest driver changes. A Bumper entry of 58 cars from both championships, but only 53 Grid spaces mean lots of homework before the event! The ILMC entries are marked out under the number box on the guides and also on the cars. Livery for the AF Corse Ferrari F430 is unclear at the moment. It could wear yellow MWR graphics (as per Le Mans) or Ebay Motors branding. Those with an eagle eye will notice the Pink Numbers on the Corvettes, to mark Cancer Awareness Month. The Guides will be updated Thursday evening for any significant livery or driver changes. I wanted to express a huge thanks to the ALMS and virtually every team who have helped during the season, helping to make the guide such a fan sucess. Thank you to everyone who has downloaded the guides on www.spotterguides.com and the American Le Mans website or purchased the guide (created by the ALMS using my car images and helmets) for charity. It is very much appreciated. Hopefully, we will be back next year. Thanks also go to our partners this year, Ten-Tenths.com, Radio Le Mans, SpeedTV.com, DailySportsCar.com Fourtitude, Speedhunters, l’endurance and the American Le Mans Series who publish the guide on the website as their Official Guide.